My story is all too familiar, six years ago I was happily married with one little girl and another baby girl due any day. Then on the 1 August 2001 my world as I knew it ended, I was diagnosed with something called MS. Being a typical male I did not have a clue on anything to do with medical matters - up to that day my only illness would be a hangover on a Saturday morning. After the initial shock, both to me and my family, came the reality of the fact that I wouldn't be able to walk, talk or even be able to control my bladder in six months. My life had ended, or so I believed. Now five years, ten months and sixteen days later I have just completed the hardest day of a ten day trek along parts of the Great Wall of China. 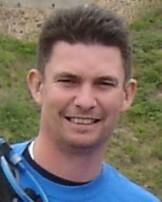 The trek started 7 days ago when I met up with 45 other strangers at ten o'clock in the morning at Heathrow airport. Twenty one of us were walking in aid of the MS Trust, the ages of the trekkers ranged from a twenty year old student walking for a children's charity through to a seventy five year old gentleman walking in aid of the Royal Marston Cancer Hospital. The day in question started for me at 6.30am with a cold shower followed with breakfast at 7.00am, our main bags had to be loaded on to the support vehicle by 7.30am. At 8.00am we started four hours of walking up and down parts of un-kept walls with one hundred foot vertical drops either side. Lunch consisted of a hard boiled egg and steamed bread (Yum Yum), after lunch we descended into a valley and walked across a rope bridge that was suspended 200 feet above a lake. The walk was over for the day, however a few of us had decided that we might walk up an infamous hill called Simatai. Hill is a little of an understatement, mountain would be correct!!! This section of the wall ascends up steep steps approximately 2500 metres, at certain sections the steps were approximately one foot high and the temperature that afternoon was in the mid thirties, what a great idea it was! We had anticipated that the walk up would take approximately two hours, more like three. The trek was an adventure and a team effort by people of all backgrounds and situations, after about an hour my body decided that this part of the wall was my own personal race, and a race that I was going to win. Subconsciously my six years of living with MS forced me to turn into a machine that pushed me harder that I had ever thought possible. I must take this point to apologies to my fellow trekkers and new friends Chris, Emma, Claire and Louise and thank them for their understanding, as when I started to pull away from them they must have realised that I had gone completely off my head and there was no stopping me. As I left them behind I felt myself going faster and faster unable to stop at the look out towers to catch my breath. Finally I reached the end of the path and could not go any further, a winner not over the guys but over the MS that had nearly sent me mad with anxiety and depression. For six years MS had ruled my life and now finally I had decided that I had won the battle. I may still have MS but MS does not have me!! I am very fortunate not to suffer from any major symptoms with my MS at present, fatigue could be considered my only symptom. My only disability was the thought that this was it for me and I had no future. 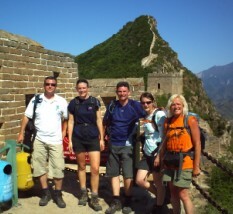 There I was in the middle of China, on top of the world and the four fittest people I know ten minutes behind me. The trek was over far to soon two days later and now, reflecting on the trip and looking at the hundreds of photos and correspondence from my fellow trekkers, I see that the trek was as much as a benefit to every individual who took part as to the variety of charities, for which we raised thousands of pounds. The trip was not only a physical challenge but also a mental challenge, helping us all to overcome fears and issues that we may or may not have known about. Well surprise surprise I have a new symptom!! This time it's trekking/hiking and walking. The six years of worrying about going to bed and praying I would be able to walk tomorrow has been replaced with me complaining that I have been stuck in the office or car all day and I haven't walked today.